Add data from the Access database in your Word document. EmmaSetup Professional Windows Installer for custom, professional installations. Test excellent package from the most called for catalogues! See popular applications and rare applications. Try software system, public domain programs, free apps, and demo programs to recieve in several classes. On Softempire website you may anywhen get new tools, or download the most recent versions of your most desired PC programs, utilities, and securities tools. To get the best software package to get, try a simple program sorter or a smart library. The Softempire catalog is at once supplemented: if there is the latest version of tools you seek out, it is probably to be in the net most wealthy computer software library! 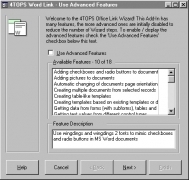 4TOPS Word Link is an add-in for Microsoft Access, which adds data from Microsoft Access in Word documents. You can compose simple and more complex documents, such as standard letters, invoices and reports. Open the Microsoft Access form which contains the data you want to appear in the document. Word Link creates a template containing mergefields for all the fields in the form (and subforms). Now you can lay out the template by putting the mergefields in the right place, adding text, formatting, etcetera. You can now create documents by selecting the template from the selection form, the mergefields are substituted with the Access data. Create ODBC Data Source Names (DSNs) on the fly with the simple click of a button saving your company both time and money! Word Link enables you to add data from the Access database in Word and Word-related documents such as standard letters, invoices and reports.